Last week I introduced to you the March Cruise Ship Madness where we matchup cruise ships in NCAA basketball tournament style to see which ship comes out as the champion. The first week of matchups are in the books and we are on to week two. Each week your vote enters you into a drawing for a $200 gift certificate. Vote every week for the best chance to win. Also, if you share the contest with your friends, you will get an extra entry for every friend that enters. Week one was a success! The Norwegian Getaway defeated the Carnival Fantasy with 85% of the votes. The big winner of the week was the Ruby Princess who took all 100% of the votes in the matchup against the MS Noordam. Also winning in week one was the Celebrity Solstice and the Norwegian Sun. Each of these ships took 57% of the votes and defeated the Oasis of the Seas and the MS Nieuw Amsterdam respectively. You can vote for your favorites through the tab on my Facebook page or you can get to the promotion directly by clicking here. You have until Saturday to vote for this weeks matchups. Have fun and good luck. the official rules for the contest can be found by clicking here Contest rules. 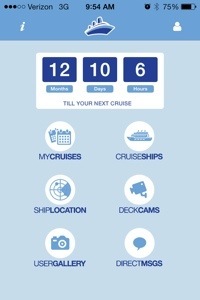 Well the cruise countdown has officially begun. Yes, a new cruise has been booked and I can’t wait for it to get here. The bad part, it is over a year away next March 15th. This will be an anniversary cruise for me and my wife for our eight year anniversary. We will be sailing on the Celebrity Silhouette on an Eastern Caribbean cruise departing from Fort Lauderdale. We will be visiting San Juan, Puerto Rico; Basseterre, St. Kitts; and Philipsburg, St. Maarten. It’s basically the ideal itinerary that we were looking for. My wife and I are probably on the same page of what we are most looking forward to. Yes that will be spending our anniversary together WITHOUT the kids. After this point, I am guessing we are on different pages. She will probably say that she is looking forward to each of the destinations. She will be sitting at work and looking at excursions and will be calling me and emailing me on what ones she likes. While I’m excited about the itinerary, I am most excited about finally getting onboard a Celebrity Solstice Class ship. My wife has already told me she is looking forward to trying Qsine and Tuscan Grille. I am looking forward to the Lawn Club Grill. The highlight of dining at the Lawn Club Grill is the opportunity to serve as your party’s “Grill Master,” by being paired with a Celebrity chef to assist in preparing the menu for your table over custom-built, ventilated grills. Plus it is located next to the Lawn Club, a half acre of actually growing green grass. I’m sure I will be writing more about this cruise over the next year but, right now, I’m just excited over a new countdown beginning. Many of you may know that I love Hawaii. I fell in love with the Aloha spirit when I first visited the Big Island on my honeymoon. After several other visits to the islands, I still can’t wait to go again. Maybe its is the warm weather, the fresh fruits and vegetables, or the laid back friendly attitude of the locals. Or maybe it is the history and the culture that draws me there. Whatever it is, I am always dreaming of returning and relaxing in the sun. What is your favorite Island? What are your favorite sights? How do you know what island is right for you? These are all questions I have been asked. Some of these are easy to answer like the Big Island is my favorite and I love seeing the whales playing off sure during the winter. There are others that are harder though like “What island is right for me?”. Each of the Islands has its own feel and appeals to a different group of people. A call to travel agent specializing in Hawaii can get you the answer to the right island question. You can expect the agent to ask you a few questions about what you like to do, what you like to see, what type of accommodations do you prefer, and more about your lifestyle. They can then match you to the island that fits you the best. But what if you want to experience more than one island yourself? You would have to arrange inter-island flights and hotels on each island you want to see. This type of planning becomes much harder making the dates and times all match up but there is another option. You can take a Hawaiian Islands cruise. Most of the major cruise lines offer cruises to Hawaii. Most offer cruises from the west coast during the winter months as they repositions ships to do Alaskan Cruises and other markets. They offer stops at multiple Islands giving you the day to explore and get a feel for each one. But what if you don’t want to spend so much time at sea sailing from the west coast all the way to Hawaii and back? Norwegian Cruise Line offers a 7-day round-trip inter-island cruise from Honolulu on the Pride of America year round. This cruise gives you by far the most time on the Islands, after all the reason you’re visiting Hawaii is to experience Hawaii. Two full days in Maui and a day and a half in Kauai as well as two days, at different ports, on the Big Island are included on this itinerary. You will also experience cruising past the Napali Coast line on Kauai. This is a truly great option to see what each island has to offer. There are many ways to experience the Aloha Spirit. My suggestion is to take the plunge and do it. You will not regret it. Celebrity is now joining in on giving the ultimate in pampering by unveiling the “Suite Class” experience on their ships. Exclusive new benefits include a suites-only restaurant, VIP lounge, complimentary premium beverages, plus much more. A personal butler will also be there to help take care of every need. This will truly be an over-the-top experience. There are 3 levels to the new “Suite Class”. The Entry Level is for guests staying in the Sky Suites. The Mid Level is for guest staying in the Signature Suites and the Celebrity Suites. Finally, the Top Level is for guests who are staying in the Royal Suite, Penthouse Suite, and the one of a kind Reflection Suite. The higher the level the more amenities are offered to you. You can see these by clicking on the link below. Private dining – A dedicated private restaurant reserved exclusively for all Suite Class guests will be available morning, noon and night. Each meal will feature unique menus that offer sumptuous dishes not available anywhere else onboard. Guests can truly immerse themselves in the local culture with specially crafted menus inspired by the local destination, and enjoy the world’s best ingredients. Memorable and inspiring dishes will be served, from locally caught seafood, to the freshest pasta. The Suite Class chef can provide a tailor-made experience to suite guests and prepare a dish to their liking, and the Cellar Master – Celebrity’s head sommelier – will select from more than 450 wines to provide the perfect pairing. Premium ‘all in’ benefits – Premium beverages, dining across all specialty restaurants, unlimited internet access and a private bar with water, sodas and beers will all be complimentary for guests staying in Royal, Penthouse and Reflection suites. VIP lounge – A private VIP lounge, Michael’s Club, will be available to guests staying in Celebrity, Signature, Royal, Penthouse and Reflection suites. A dedicated Concierge service and unique food and beverage experiences by Celebrity’s James Beard- featured chef will be provided to guests. This amazing news from Celebrity is another example of how the mainstream cruise lines are stepping up their product to their top end customers. Just last Month Norwegian Cruise Line introduced their Butler Drawn Bath Menu for guests staying in their suites and in The Haven. You can read more about that in my earlier post Being Pampered, What Would You Pay?. If you can afford it these options sure seem like a great way to get pampered while on you cruise vacation. Are you a foodie? If you are, yesterday’s news from Celebrity Cruise Line and Bravo’s “Top Chef” might just be your dream come true. The two announced a partnership that will bring a taste of the Emmy® Award-winning culinary competition while sailing the seas on 10 of Celebrities’ modern luxury ships. This will be the cruise industry’s first Top Chef-themed licensing partnership on a large scale. July 27 2014 on the Celebrity Summit sailing to Bermuda. September 19, 2014 on the Celebrity Infinity sailing to: Paris (Le Havre), France; Bordeaux(La Rochelle),France; Bilbao, Spain; Vigo, Spain; Porto (Leixoes), Portugal; and Harwich, England departing from Harwich, England. November 15, 2014 on the Celebrity Reflection sailing to: San Juan, Puerto Rico; Charlotte Amalie, St. Thomas; Philipsburg, St. Maarten; and Miami, Florida departing from Miami, Florida. In addition to the four exclusive cruises with “Top Chef” alums, Celebrity will also introduce Quickfire Challenges and “Top Chef”-inspired menu evenings to its modern luxury vacations on all sailings departing July 2014 – June 2015. The four exclusive cruise will be sure to fill up fast so, if you want to experience this, you should book your cruise soon. Being Pampered, What Would You Pay? When you hear the word “pampered”, what comes to mind? The Webster’s Dictionary defines pamper as “to treat (someone or something) very well: to give (someone or something) a lot of attention and care.” For you, does it mean to be offered great food by a waiter? Maybe it means that someone will drop everything to help you out. Or does it mean that you get care beyond what you get in everyday life? Norwegian Cruise Line is adding to what they think the word pamper means. Last week they announced the addition of a Butler-Drawn Bath Menu that will be available to all suite guests on their 12 ships. The menu features 7 different bath options that will surely make you feel like a queen. Your certified butler draws each bath. And, yes, if you are staying in The Haven, Norwegian’s ship within a ship concept, you can order from this menu. What are these baths you maybe asking yourself? For the ultimate in luxury, you may want to try the Mediterranean Soak. Your bath will be filled with French verbena bubbles. You will be served a glass of Dom Perignon champagne and feast on sturgeon caviar while you soak wearing an eye mask. Mexican Riviera Retreat, where you can ease into a siesta with a lime exfoliating body scrub with loofah. You will be enjoying the perfect nightcap of a freshly made, all natural margarita with 100% agave tequila, premium triple orange liqueur and fresh squeezed limes. Caribbean Calm, you will feel like you are in the tropics while enjoying a passion fruit bath gel with exfoliator gloves, topped off with a hand- muddled Mojito prepared with Bacardi Superior, fresh mint and hand pressed limes. Hawaiian Bloom, you will find your own tropical paradise by slipping into a plumeria milk bath with floating flowers and be treated to a coconut kiwi pineapple splash prepared with Bacardi Rock Coconut, pineapple juice, lemon lime soda with chunks of fresh pineapple and kiwi. You will be sure to find your own ALOHA spirit! Alaskan Plunge, you will experience refreshing relaxation with pine bath salts and a back scratcher. After soaking, you can enjoy a cold pitcher of strawberry lemonade with Stolichnaya vodka, fresh strawberries and hand pressed lemons. Great Island Oasis, you will slip into a seaweed eucalyptus bath, complete with bath pillow and passion punch made with passion fruit liqueur, vodka, fresh fruit juices and sparkling wine. And don’t forget the kids because they need pampering too! With the Wonder Waterfall, your kids will love to splash around with kiwi fruit berry bath bombs. Then be treated to a yummy kid-friendly strawberry and banana smoothie. For me, there isn’t a low enough price to make this worthwhile because I haven’t taken a bath in…well…I don’t remember the last time I have soaked in a bath. I am not the type who enjoys sitting in a bathtub. I am more of the “Take a shower and get on with your day” type of person. But for those who do enjoy their baths and find them relaxing, what would you pay for these bath experiences? The Mediterranean Soak will cost you only $499. To pamper your kids with the Wonder Waterfall will only set you back $49. All the other baths go for $99. I am curious, how many of you think these baths are worth the price? How many of you think these are an inexpensive way to be pampered? How many of you would take advantage of having someone draw you a special bath like this? How many of you think I am crazy for not enjoying soaking in a bath? Please comment on your thoughts. Carnival Cruise Line announced a partnership with Dr. Seuss Enterprises to bring to life the beloved children’s books to the lines 24 ships. In what they claim as an industry first, the Carnival Seuss at Sea program will give kids plenty of activities, entertainment, and dinning fun while onboard. Royal Caribbean and Norwegian Cruise Line already has partnerships with DreamWorks Animation and Nickelodeon, respectively, bring their characters to life on their ships. Not to mention Disney Cruise Line, who doesn’t need a partnership to bring characters children love on their ships. Like Royal Caribbean and Norwegian Cruise Line, Carnival will offer The Green Eggs and Ham Breakfast in the main dinning room on the first sea day. For five dollars per guest, attendees will have the wait staff serve them foods inspired by Dr. Seuss books. Characters from the books will also join them at their tables for even more fun and photo opportunities. There will also be Seuss story time help on sea day on each voyage, which will include some of your favorite Dr. Seuss characters. There will be opportunities for guest to meet and get their pictures taken with the characters. A Seuss-a-palooza Character parade will also take place, much like the DreamWorks Character parades on Royal Caribbean. The Carnival Freedom, which will get refurbished in May, along with the Carnival Vista, set to debut in 2016, will feature the Dr. Seuss Bookville. This will be a fun play space inspired by the world of Dr. Seuss. The Seuss at Sea program will debut on the Carnival Splendor in February and will be on all 24 Carnival ships by 2015. While this may not be totally an industry first, it sure promises to be fun for people of all ages who love the rhymes of Dr. Seuss. On a nice day in late September, I had the privilege to tour the Norwegian Cruise Line’s (NCL) Norwegian Gem. Since there are no real opportunities to tour a ship in and around Wisconsin, I need to fly out somewhere and spend a night or go to a conference to take part in a ship tour. So, with this in mind I flew into New York City the night before and stayed at place using Airbnb. You can read about my stay in a previous post A Un-hotel Option. That Saturday morning, after catching a glimpse of the ship from the top floor of the apartment building I stayed at and drinking my cup of coffee, I walked the few blocks down to pier 88 of the Manhattan Cruise Passenger Terminal. NCL allows us to bring a guest along on the ship tour, so I met up with my clients outside the terminal and made our way inside. After going through the normal process of giving up our I.D. to get the visitor badge, we were shown to a waiting area so we can wait till the group was ready. What a perfect time to grab a picture of the artwork on the hull of the Gem. When we were ready to board, we were taken through the security line where our carry-on bags were checked and were led on board. This ship does have the WOW factor when you walk into the Crystal Atrium. It is beautiful! I will get into the public areas of the ship more in another post since we were whisked off to tour the staterooms first. We were shown the three bedroom garden villa that I will only be able to see on a tour or in my dreams. This suite goes for just under $22,000 for a 9-night cruise. After that, we were taken down to see the balcony and inside cabins. They are well decorated and more spacious than other ships that I have been on. Lets face it though, how much time are you really going to spend in your stateroom? There is so much to do on this ship you will want to spend as much time exploring it as you can. I will get more into the public areas and all the activities there is to do in my next post. I recently had to take a quick trip to New York City to tour the Norwegian Gem. I was traveling by myself and only spending one night. Asking around, the Hotel Tonight smartphone app was brought to my attention and I made up my mind that this was the way I was going to get myself a room for the night. With Hotel Tonight, you can get really good discounts but you can only reserve your room after noon of the night you want to stay. About four days before I was flying out, I realized that the UN General Assembly was happening in New York. A quick check on the app and I realized hotels were going to cost me more than I wanted to spend. I quickly exited the Hotel Tonight app and clicked on the Airbnb app. Airbnb is a website that people can list their apartment that they want to rent out for a night or so. That’s right, you’re not staying in a hotel at all but staying in someone’s house, apartment, or even just a room in their house or apartment. The major benefit with this option is significant savings on you accommodations. After doing a search for my destination, I found a in the Hell’s Kitchen area. After a quick conversation through Airbnb with the host, I made my reservation. I was little relieved at that point but still nervous because I never used this site and never stayed someplace like this while I traveled. After landing in New York I made my way over to where the apartment building was located. I was in contact with my host through text messages the whole time. She wasn’t quite ready for me, which was ok since I could check out where I had to go the next day to tour the ship. I then spent some time in a park down the street enjoying a beautiful day till she was ready for me to come up. When she was ready for me I made my way to her building, announced my self at the front desk, and was on my way up to her apartment. The apartment was a small studio on the 6th floor of a fairly new building. The studio wasn’t real big, but then again I’m used to whole houses and not studios and apartments in high-rise buildings. It had everything I needed for staying the night and the location was excellent. It was really close to 9th ave. in the Hell’s Kitchen area. There are tons of restaurants nearby, a real foodie destination. It was also only four and a half blocks from the pier where I had to go the next day, perfect for me. My host was very nice and made the whole experience with Airbnb a good one. I would definitely use it again on some of my other travels when hotel options just don’t work out.